The Original Shop Floor CMM - CMM Inc. 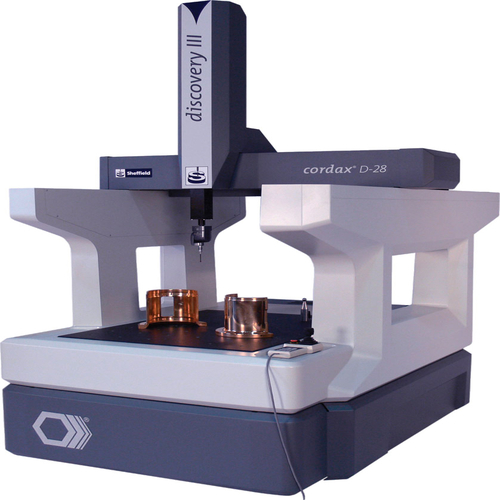 The Sheffield Measurement Cordax® Discovery CMM has been adopted by hundreds of manufacturers around the world and is the original shop floor CMM. Discovery III builds upon its predecessor’s many successes, featuring outstanding accuracy, extended thermal performance, and a modern industrial design. This shop floor coordinate measuring machine continues to answer the question: Who wants to wait for results from the quality lab? The Sheffield Measurement Discovery III uses hardened machine tool re-circulating ball bearings running at just a fraction of their rated load. This contributes to long life and lower maintenance costs in some of the harshest shop environments. With no need for air and a roll-around stand, Discovery III provides the ultimate in flexibility. With the addition of the CMM-Ve and ScanShark sensors, the Sheffield Measurement Discovery III is a true multi-sensor shop floor CMM. With optional racks, changing between non-contact, touch trigger, and analog scanning probes is automatic. PC-DMIS and PolyWorks state-of-the-art software manage data collection and analysis. PC-DMIS CAD++ enables scanning and digitizing functions for fast and efficient measurement of complex three dimensional shapes. The measured point clouds are imported into PolyWorks/Modeler to create accurate, smooth polygonal models and NURBS surfaces.